Ian Hutchinson on the Honda Racing Fireblade at the 2018 Isle of Man TT. Honda Racing has unveiled a new-look line-up for the 2019 international road races, with Australian rider David Johnson teaming up with Ian Hutchinson for the North West 200 and Isle of Man TT. Both riders will compete in the Superbike and Superstock classes on CBR1000RR Fireblade machinery, with the team also preparing a CBR600RRR Supersport machine for Yorkshireman Hutchinson. David Johnson will join Ian Hutchinson in a new-look line-up for Honda Racing. The 16-time TT winner was hampered by injury throughout 2018, but Hutchinson - who is entering his second season with the team - says he is full of confidence for the year ahead. “I’m feeling confident coming into this season on the roads. 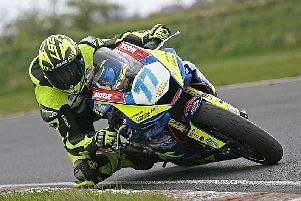 Last year was about building back up and learning the Fireblade again,” he said. “The results were a little disappointing, as they didn’t reflect the hard work that went in behind the scenes. But since the TT I have been out on a track Fireblade and also my road bike, so with that mileage and the testing programme we have for this year, I think we’ll be in a strong position when we arrive at the North West 200. Aussie Johnson said he was thrilled to be joining a team with such a proven track record at the international meetings. He takes over the ride from Fermanagh's Lee Johnston, who has been linked with a return to BMW machinery this year. The Honda Racing team will embark on a comprehensive testing programme before the North West 200 in May.